Over 25 years ago, for political, economic, social, and ethnic reasons, the breakup of Yugoslavia has happened. Before that Yugoslavia was considered the best developed of all communist states, today most former Yugoslav republics are rather poor countries. There are, naturally, two exceptions: Slovenia (a well-developed country with a very high quality of life) and Croatia. It is no surprise, since these countries were the richest and the best developed republics of Yugoslavia. It was also one of the reasons for the breakup of the country, because Slovenes and Croats did not want to financially support the less-developed republics and did not see benefits of being a part of Yugoslavia. 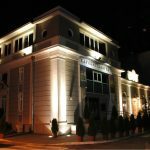 During the last 25 years some former communist countries in Europe have managed to transform from poor and poorly-developed to well-developed countries with high-income economy and a good quality of life, some former Yugoslav republics seem to be steeped in economic and political crisis. It is no surprise that Slovenia has the highest GDP per capita: EUR20,370 (nominal) and EUR30,311 (Purchasing Power Parity, PPP). It places Slovenia among the 40 countries with the highest GDP per capita in the world. 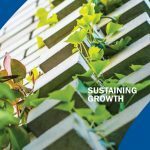 The second former republic of Yugoslavia, Croatia, has GPD of EUR11,222 (nominal) and EUR21,214 (PPP), which situates Croatia around the 60th place in the world ranking. Other former republics of Yugoslavia are much lower on the index. Bosnia and Herzegovina has the lowest GDP per capita: EUR4,056 (nominal) and EUR10,443 (PPP). Human Development Index (HDI) is calculated based on life expectancy and economic indicators and it represents the human progress in different states. 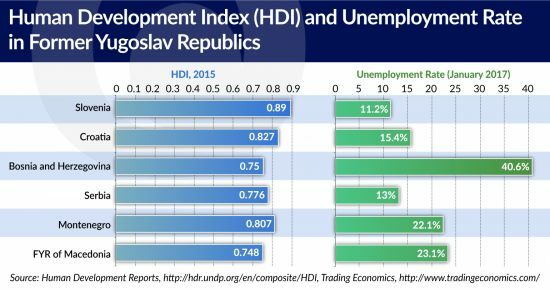 According to HDI, Slovenia, Croatia, and Montenegro are ranked as highly developed (25th, 45th, and 48th places respectively), whereas the rest of former Yugoslav republics are not as well-developed: Serbia is ranked 66th, Bosnia and Herzegovina 81st, and the FYR of Macedonia 82nd. 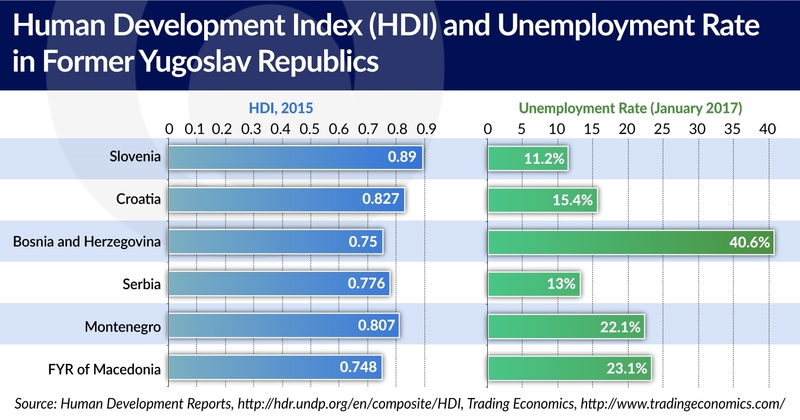 According to the HDI, Slovenia is ranked just after Belgium, Finland, and Austria, whereas FYR of Macedonia just before Algeria, Armenia, and Ukraine. The average unemployment rate in the European Union is estimated to be about 8 per cent. However, although Slovenia and Croatia are the members of the EU, their unemployment rates are higher and can be considered as quite high. Slovenia has an unemployment rate of 11.2 per cent, meanwhile that of Croatia is 15.4 per cent. Serbia has a lower unemployment rate than Croatia (13.0 per cent), however in other former Yugoslav republics it is very high: 23.1 per cent in the FYR of Macedonia, 22.1 per cent in Montenegro, and a soaring 40.6 per cent in BiH which has one of the highest unemployment rates in the world. 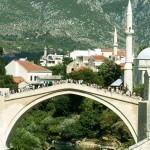 In Bosnia and Herzegovina three constituent ethnic groups – Bosniaks (Bosnian Muslims), Croats, and Serbs – have different views on a number of issues. 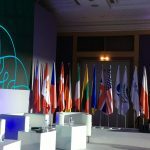 The political system established with the Dayton Agreement, which ended the war in 1995, seems to be very ineffective and causes serious obstacles to making important decisions. Suffice it to say, BiH also has a very high unemployment rate among young people, which is estimated to be between 50 and 60 per cent. The differences in average monthly salaries are significant. The average monthly net salary (after tax) in Slovenia is estimated at EUR1,002, and this is more than in Portugal (EUR813) or Greece (EUR725). In Croatia the average monthly net salary is EUR695, and therefore higher than in Lithuania (EUR631), Romania (EUR503), or Hungary (EUR489), but less than in Czech Republic (EUR827) or Poland (EUR756). In Montenegro it is estimated to be EUR452, which is only slightly less than in Bulgaria (EUR459), which is a member of the EU. What is interesting, the average monthly net salary is noticeably higher in BiH (EUR418) than in Serbia (EUR320). However, it is noteworthy to emphasize that Bosnia and Herzegovina has a huge unemployment rate and a big part of the population is either unemployed or works within the shadow economy. Among the countries of former Yugoslavia, the lowest average monthly net salary is that of FYR of Macedonia: it is only EUR289. According to data from Numbeo.com, only few European countries have it lower: Albania (EUR260), Moldova (EUR218), and Ukraine (EUR199). Although the salaries in Serbia are, officially at least, lower than in Bosnia and Herzegovina, the prices of flats are visibly higher. The average price of one square meter of a flat outside the center of Serbian cities is estimated at EUR865, whereas in Bosnia and Herzegovina it is EUR767. As could be expected, the prices are the highest in Slovenia (EUR1,449) and Croatia (EUR1,212). Prices of flats are also quite high in Montenegro: EUR1,069 for square meter outside of the city center. Undoubtedly, the inflated prices in Croatia and Montenegro are caused by their well-developed tourism industries and foreign real estate investments in seaside resorts. The lowest prices for one square meter of a flat outside the city center are found in the FYR of Macedonia (EUR691). Although real estate prices in Slovenia are the highest among all former Yugoslav republics the citizens of Slovenia need the shortest time spent at work to afford a 60 square meter flat outside the city center: it is a cost of 86.8 average monthly salaries. If we assume that an average Slovene spends half of his salary, then he will need 173.6 months (14.5 years) to buy a flat. If we assume that an average citizen of Serbia earns EUR320 (after tax) monthly and spends only half of it (EUR160), which is rather impossible due to high prices of groceries in Serbia, he needs 324.4 months (27 years) to buy a 60 square meter flat. This can be a perfect explanation as to why so many young people gathered on streets of Serbian cities in April to manifest their profound disappointment with the political elites. Michał Kowalczyk is a PhD student at the History and Social Science Department of the Cardinal Stefan Wyszyński University in Warsaw. He specializes in Hungarian and Central European politics. How stable are the Balkans?